How to efficiently maximise real impact in a data-driven marketing world. All too often, marketers get caught up in their channel-specific metrics – clicks and impressions for display and social media, clicks and opens for email, attendees for events etc. But whether you’re a marketing leader or channel manager, what really matters – and what you want to optimize for – is the impact each marketers has. 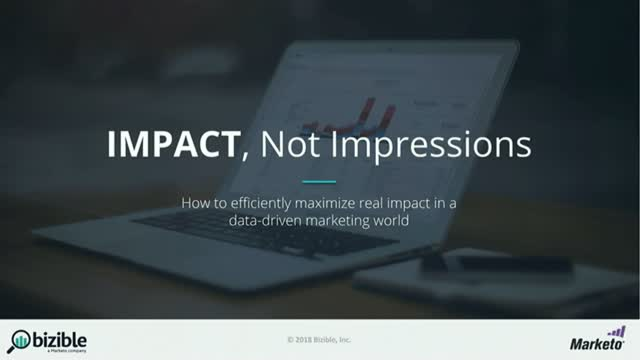 In this webinar, featuring marketing leaders from Bizible and Marketo, we’ll discuss how marketers can engage, measure and optimise their efforts to make sure they’re making a real impact, not just serving impressions. Deliverability is an interesting beast. Spam filters and email UIs change frequently, malware and phishing campaigns are growing in number, and new laws and compliance regulations are altering the data privacy landscape. With the right approach, you can overcome an ever-evolving email ecosystem. Join Kiersti Esparza, Head of Product Management, Email Delivery and Compliance, and Carmi López-Jones, Manager, Professional Services, Email Deliverability, to learn how to ensure your emails make it to the inbox. As a marketer, you've probably wished you could respond to prospective buyers anywhere and everywhere, at any moment in time, right? With triggered campaigns, you can! Watch Mike Madden, Director of North America Commercial & Customer Demand Generation, as he broke down the powerful use cases for triggered campaigns, from scoring specific actions to prioritizing leads for sales to creating timely emails from website visits! Digital transformation has forever changed the rules of engagement with our audiences. Buyers now expect a seamless and engaging experience throughout their journey, putting the burden on organizations to break down departmental silos and create a seamless, unified customer experience (CX). Whether you end up a winner or not will depend on how you respond to these market shifts and change the way you acquire, use, and steward customer data. Join us for a live webinar featuring IDC Research Analyst, Gerry Murray, and Marketo Director of Customer Marketing, Janet Dulsky, as they explore the power of customer centric data and the impact it can have on CX. How does Marketo get the most out of their own search and social advertising campaigns? Join Scott Minor, Online Marketing Program Manager, and Favian Castillo, Digital Marketing Specialist, as they spill the beans on their paid strategy at Marketo. - Retargeting, ABM campaigns & more! Did you know that 90% of content that you share are forgotten after 2 days? How do you expect your buyers to act on your message if they only remember a tenth of it? How do you even know which tenth they'll remember? Join this webinar to hear from Dr Carmen Simon, a Cognitive Neuroscientist, author of Impossible to Ignore: Create Memorable Content to Influence Decisions, and a renowned keynote speaker. Revenue performance has become standard for B2B marketers with more than 3/4 of global B2B marketing decision makers measuring marketing’s impact on pipeline & revenue. But as recently as a decade ago, the idea was radical. Marketing leaders adopted the practice, requiring cultural change, re-engineering of the marketing & sales process, & deep investment in marketing automation. We’ve seen the results; revenue marketers contribute nearly 30% more than other B2B marketers. It’s happened to all of us—you think you have everything you need to make that great dish for your dinner party to only realise halfway through you are missing some essential ingredients. Sound familiar? Now apply that to your ABM and sales strategy at work—do you have everything you need to ensure a great result? Marketo has brought together three Partners that will help you create the perfect recipe for your ABM and sales strategy. Watch Marketo, Folloze, Metadata.io, and PFL for The MarTech Recipe For a Well Done ABM and Sales Strategy. How do you identify who and when prospects are interested in your services. You probably have a database of thousands of ‘dead’ leads. How do you find those still interested in hearing from you and get them to love you (again) with content that’s relevant? Watch Bombora's Millie Resnick and Marketo’s Mike Madden, Director of Demand Generation, as they break down how intent data can help you find prospect love again among new and ‘dead’ leads, and prioritise them for sales. Curious to see how the Marketo Demand Generation team uses Marketo to scale programs and grow revenue? Watch Mike Madden, Director of Demand Generation, as he breaks down the core marketing automation principles to building a demand generation machine that scales, performs across regions and drives more business! This session will look extensively at the adoption and application of Marketing Technology in Financial Services, primarily amongst established brands, rather than over-focusing on the burgeoning FinTech space. For a fresh perspective it will compare and contrast to other industries, is FS leading or lagging? Finally, it will cover ‘the where next’ for the industry and highlighting a few of what we think will be the emerging/influential tech brands of the future. Marketing automation technology is driving change in every industry – and financial services is no exception. More pressure than ever before is being put on creating personalized and meaningful connections through every stage of the customer journey, and marketing automation platforms like Marketo are helping marketers reach their goals faster. This session will focus on strategically implementing marketing automation to generate demand and amplify sales efforts within the financial services sector. In this new era of information and connections, the relationship between buyers and sellers has changed forever. Nobody wants to sold to or to be just a database target. You need to engage prospects. Today’s buyers want to be heard and helped, on their terms, not yours. Join Jill Rowley, Marketo’s own Chief Growth Advisor and social selling evangelist, to discuss how marketing and sales teams can work together to transform your digital sales strategy. Tomorrow’s Marketer is focused on targeting key accounts to generate new business. What’s the secret to creating 1:1 moments with your key targets? Personalisation and Predictive Technologies are the secret weapons that empower account-based marketing (ABM) strategies to target and engage key accounts at the top of the funnel. Whether you've barely heard of account-based marketing (ABM) or you've been running targeted campaigns for years, there are a few potential mistakes you need to have on your radar. Join us as we discuss the top eight ABM mistakes – from account selection, to setting a strategy, to measurement – and how to avoid them. Getting your marketing automation software investment signed off is just the first step to driving deeper customer intelligence and more meaningful customer relationships. In today's competitive world, we all need a few extra tips to set our marketing efforts above the rest. Join us for this webinarr, Attract More Customers with Inbound and Outbound Marketing, and learn ready-to-implement best practices to help you optimise your inbound and outbound marketing efforts! If earning targeted new business and retaining higher numbers is your game, then play to win with account-based marketing (ABM). watch Marketo experts discuss the Essentials of Account-Based Marketing and walk you through the strategy that scores by focusing on high-yield accounts.